Add RING1B polyclonal antibody - Classic to my shopping cart. Request a quote for a bulk order for RING1B polyclonal antibody - Classic. Please fill out the form here below. Your local sales account manager will get in touch with you shortly and send you a quotation based on your requirements. Polyclonal antibody raised in goat against RING1B (Ring finger protein 1b), using a KLH-conjugated synthetic peptide. 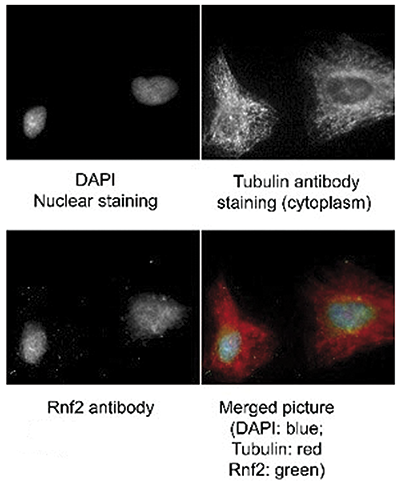 Immunofluorescence of RING1B antibody. Tissue: human HeLa cells. Fixation in methanol and blocked with 0.2% fish scale gelatin for 1 hour at 25°C. Primary antibody at 1:300 for 20 minutes at 25°C. Secondary antibody: Alexa Fluor®488-conjugated Donkey anti-goat IgG secondary antibody at 1:500 for 45 min at RT. Localization: RING1B is nuclear and occasionally cytoplasmic. Staining: RING1B (RNF2) as green signal, Tubulin cytoplasm staining red, and DAPI (blue) nuclear counterstain. Western blot using the Diagenode RING1B antibody shows detection of a 38 kDa band corresponding to human RING1B in 3T3 (lane 1), U937 (lane 2), Jurkat (lane 3), mouse brain (lane 4) and CHO-K1 (lane 5) cell lysates. Approximately 20 μg of lysate was run on a SDS-PAGE and transferred onto nitrocellulose followed by reaction with a 1:500 dilution of RING1B antibody incubated at room temperature. 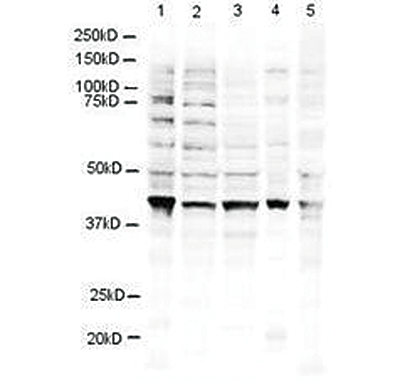 Diagenode strongly recommends using this:	RING1B polyclonal antibody - Classic (Diagenode Cat# C15430002 Lot# 001). Click here to copy to clipboard.